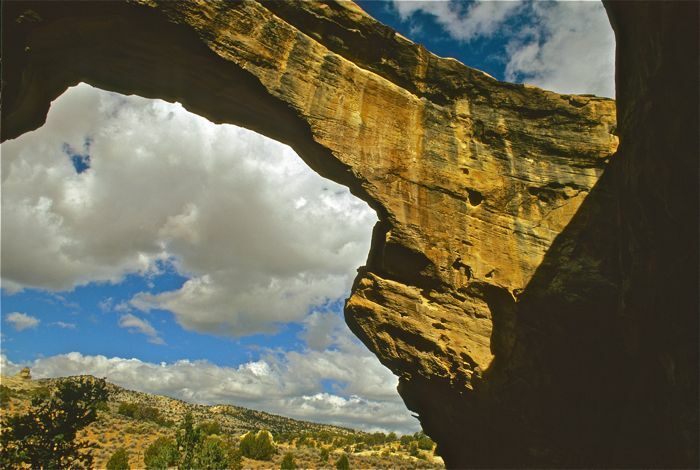 Southern Utah’s famously beautiful canyon country includes some of the most unusual landscapes on Earth. A few miles north of the Arizona line, we’ll explore one of the most remote little-known sections of the Grand Staircase-Escalante National Monument — a colorful and rugged world of deep canyons, high mesas, arches, sand and slickrock punctuated by twisted junipers and big vistas. 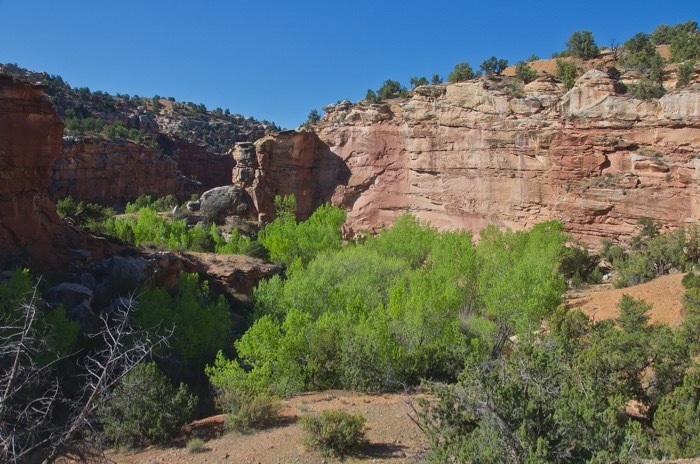 Hackberry Canyon and a little-known section of the upper Paria River are within this wild and magnificent area. Warm sunny days with cool to chilly nights are typical, but we must be prepared for brief spring storms that occasionally water the high desert. Spring wildflowers are blooming, and most of this fairly strenuous Utah backpacking hiking trip is off-trail. The trip base is Cedar City, Utah. The huge Grand Staircase-Escalante National Monument was designated by President Clinton in 1996. These colorful canyons and mesas lie about 75 miles west of our beautiful Escalante Canyons trip, which is partly within this national monument and partly within the Glen Canyon National Recreation Area. TREK BASE: Stratford Court Hotel, 18 S. Main, Cedar City, Utah 84720; (435)586-2433. The El Rey Inn and Suites is next door and owned by the same people. TRANSPORTATION: Air service to Cedar City; call motel in advance for airport pickup. Or, fly to Salt Lake or Las Vegas and rent a car or ride a bus. TREK RATING: Daily backpacking mileage varies from 6 to 10 making this trip Fairly Strenuous. There are no maintained trails and lots of slickrock and soft sand. There’s canyon bottom water but the upper canyons and the mesas are dry. Total backpacking miles: about 30. ELEVATIONS: 5000-6500 feet; max one day uphill with backpack: about 1500’. WEATHER: Typically warm and sunny with chilly to frosty nights; high desert spring storms are not unusual, but tend to be fairly brief. It can snow or be 80 degrees with hot sun. FISHING: Fishing opportunities ceased with declining stream flows at the end of the Pleistocene epoch, about 8000 years B.P. SPECIAL FEATURES: Wild, little-known country in the heart of the Grand Staircase-Escalante National Monument. Colorful rocks. Spectacular views and awesome sandstone formations; Deep red-rock canyons with verdant canyon bottoms, arches, desert streams, pinyon-juniper forests. Peregrine Falcons and other birds of prey frequent the area. Great star-gazing. SPECIAL TIPS: Travel light since we may carry our camping water for portions of one or two backpacking days. There will be at least one layover. Bring iodine tablets in case the silty water clogs your filter (we do recommend purifying drinking water on this trip). Please carry 2 quart or liter water bottles. 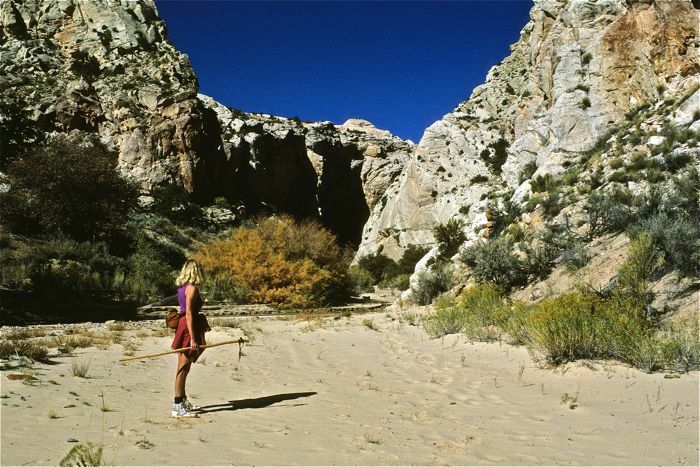 STATUS: Protected as a monument, but the area needs protection as designated Wilderness. ITINERARY: The area is about a 2 or so hour drive from Cedar City. Expect one camp up on the high mesa. Most routes are loops, and there should be plenty of time for exploring side canyons, climbing atop sandstone formations, and contemplating the true meaning of life under the impossibly big and cobalt-blue Utah sky. 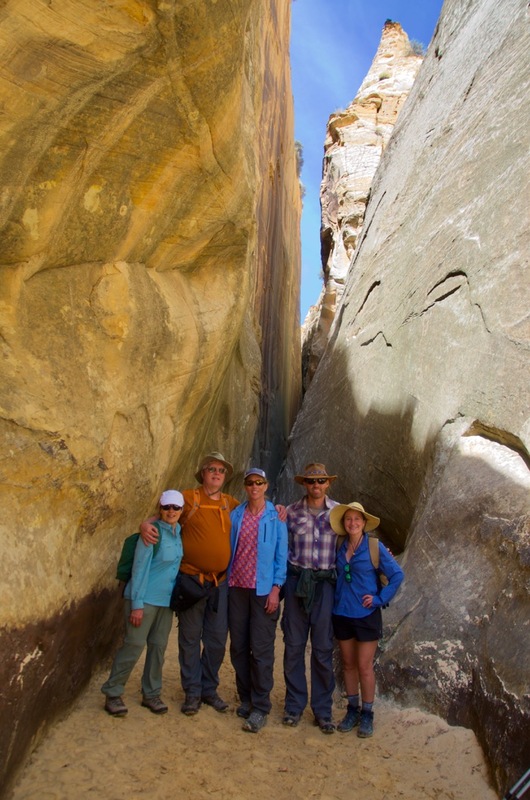 RELATED UTAH BACKPACKING TRIPS: Go to the following link to read more about our other Utah hiking trips. Please Note: Because we vary the route as conditions dictate, miles and elevations are approximate. Also, this trip is offered only in even-numbered years.